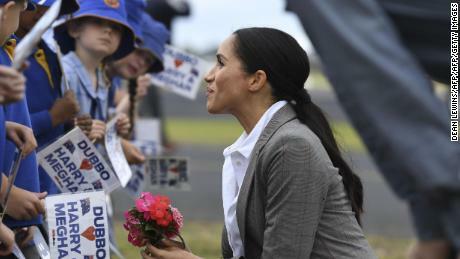 Harry and Meghan were in Melbourne on Thursday and spent time on a beach, a tram and met with a local chef. However, pupils from Trinity Grammar, who have been involved with the programme, forgot to tell them about the noise generated when the cars started. "I said, 'I know it's against royal protocol but can I please have a hug?'" India Brown asked Harry as he walked by, according to The Herald Sun. Paul Burrell worked for Princess Diana when Prince Harry was a young boy growing up in Kensington Palace. "He said, 'Oh, you're going to get me in trouble.'" But that's Harry's middle name. "I had it engraved on the back, 'To M.M. From M.M.' And I plan to give it to my daughter one day". "I'm not sure I did it right! ", she added. She did a handball. Clutching flowers and waving flags, the screaming crowds turned out to welcome the pair, who were delayed in traffic after flying in from Sydney on the third day of their tour Down Under.